We began homeschooling 4 years ago and about 2 months into our first year I discovered Ambleside Online. Ambleside is a free, online curriculum based on Charlotte Mason's educational philosophies. The board has worked hard to find the best available resources to help the current day family embark on a journey of gentle learning with "living books". These living books are well written and never talk down to the child. They are rich in vocabulary as well as information. I love that most of our books don't feel like a text book, but allow my children and myself to learn in a more conversational way. Nature study and observing what is there is one of the ways that I feel it is different from most curriculums. This is also a very challenging curriculum. Latin and Robinson Crusoe are two of the more challenging topics for Year 4 in my opinion. My daughter loves Latin, but Robinson Crusoe is a rich book that though she isn't enjoying it as much as some of the other books, I know she is learning and benefiting all at the same time. The history texts are fun and engaging and she is making many connections between what she is reading. Our Book of Centuries will make a wonderful tool for her to use the rest of her life as she can mark down important events and people and see how they relate. There is a FAQ page on the website that answers the questions of someone wanting to research this direction of learning. There are also support yahoo groups where any question can be answered by many encouraging moms who have done this for a while and are so willing to help you succeed in your educating of your children. Ambleside is not for everyone, but we love it and plan to stay with this curriculum as long as we are able to homeschool. Blessings as you find what you need to educate your child. 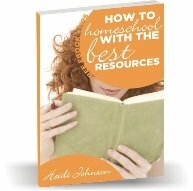 Ages 6 through high school with resources for "preschool" as well. Many of the books can be read online, downloaded or printed for free. Others can be borrowed from your local library. I choose to purchase most of mine, but you don't have to. Both my girls have done really well with this curriculum and lifestyle of learning. I hope this review has been helpful to you.